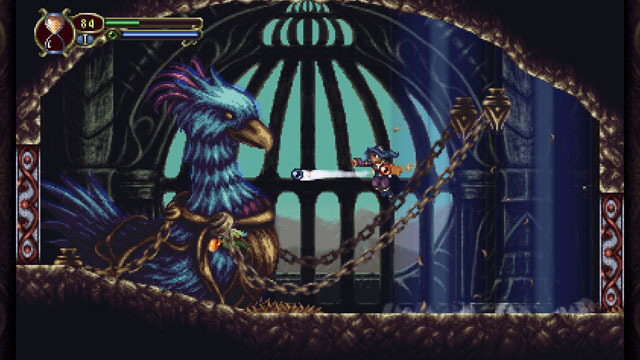 Timespinner, from Lunar Ray Games, stars Lunais, a young woman seeking vengeance against the ones who killed her family. Using a device known as the Timespinner, the woman travels through time to defeat her enemies throughout history. In this metroidvania title, Lunais navigates a number of platforming environments, using her time-stopping ability to solve puzzles, move across falling platforms, evade enemies, and even freeze baddies in the air to use them as stepping stones to reach new areas. In addition, Lunais may access a number of magical orbs that allow her to unleash projectile and melee attacks that grow stronger as she uses them. The game is now available on PC, Mac, and Linux via Steam, and PS4 and Vita via PSN.